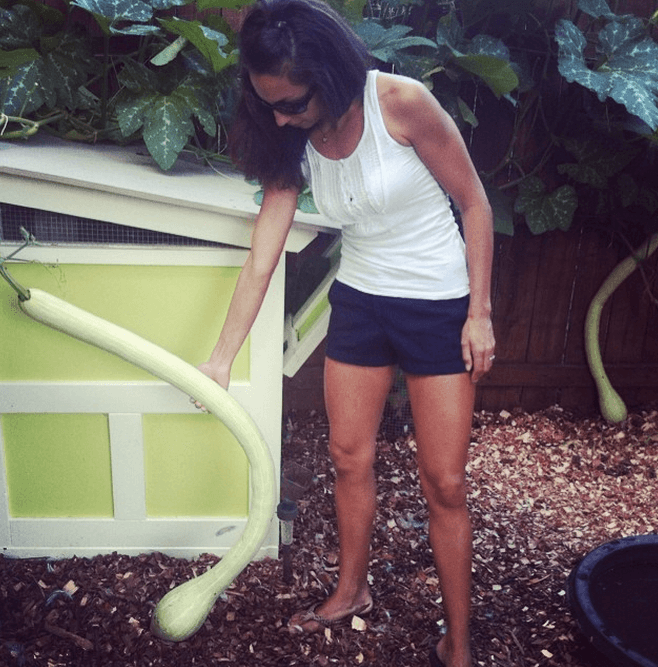 Do We Grow Or Save $24,000 of Food Per Year In Our Yard? 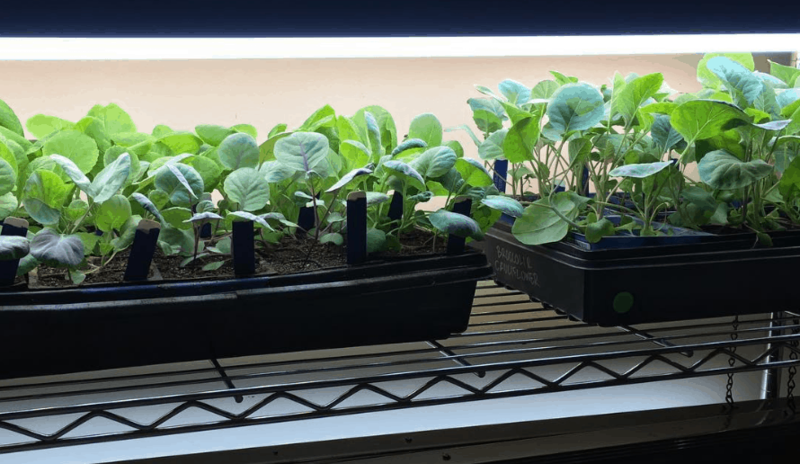 Recently, LearnVest wrote an article about us (Aaron and Susan von Frank, the husband and wife cofounders of the GrowJourney Seeds of the Month Club) that was then syndicated into Forbes, Business Insider and a bunch of other media outlets. In case you’ve never heard of it, LearnVest is a terrific financial education website. It’s not the reporter’s fault, but we want to make it clear that we’re not backyard gardeners. Our front, side and back yard areas are all stuffed full of edible annual and perennial plants, save for a few grass paths. Years ago, we arrived at the conclusion that it made a lot more sense (and cents) to grow organic produce than turf grass on our little piece of earth. Secondly, in hindsight, we should have added more qualifiers to the numbers we discussed with LearnVest. Money is a very clumsy, one-dimensional instrument of measurement. 2) I don’t remember what we spent on groceries last month, much less five years ago. Plus, what we used to eat is so different from what we eat now that it’s like comparing apples to oranges. 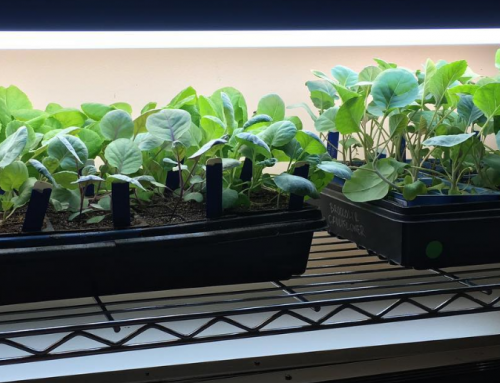 Do we “save” $24,000 per year in grocery bills by growing a lot of our own food? Some commenters on the article expressed doubts that this was possible. Hopefully, this blog post provides a well-reasoned response and will elevate the conversation beyond the metric of money. How Much Does a Piece of Land On Mars Cost? 1. How do we determine the financial value of something that has no comparable sales data? Salt and pepper are not the only spices in the world; in fact, they’re pretty boring and don’t scratch the surface of what’s available in a real spice shop. 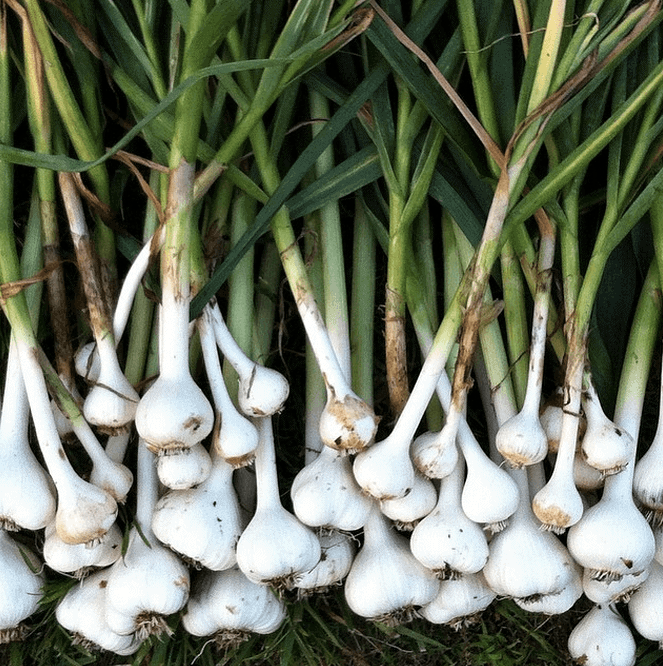 Likewise, the produce (fruits, veggies, herbs, fungi, etc) you buy in a grocery store is the “salt and pepper” of the food world: it’s not going to turn anyone away, but it’s not particularly exciting (plus there’s a good chance it was grown in the most environmentally destructive ways possible and picked by the 21st century equivalent of slaves). The reality is that there are thousands of varieties of produce that most people will never see or experience. This is a shame, because these foods (mostly heirlooms) are our inherited genetic library, and they are loaded with nutrition and flavor that makes you feel great while exciting your taste buds in ways you’ve never experienced. 2. 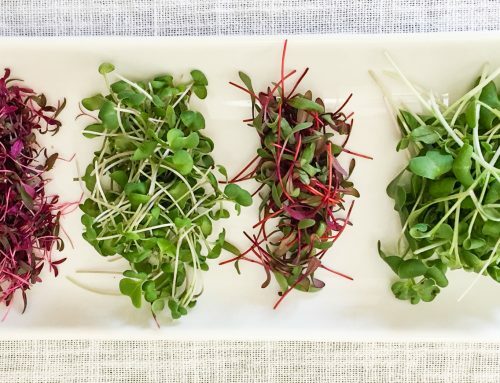 If we grow or forage something that we COULD find for sale, aren’t our items more valuable if they are fresh-picked, organically grown and not sitting on a grocery shelf for days, weeks or months prior to purchase? When is produce most nutritious and best tasting? Immediately after picking. Not to mention, when we harvest and eat food from our yard, we don’t have to waste time, fuel and money driving across town to go get them. 3. We don’t keep grocery receipts from one year ago, much less from over five years ago. To be clear, we still buy groceries, even if we buy very little produce. We don’t make our own toilet paper, paper towels, milk, etc. We do not want to be self-sufficient. 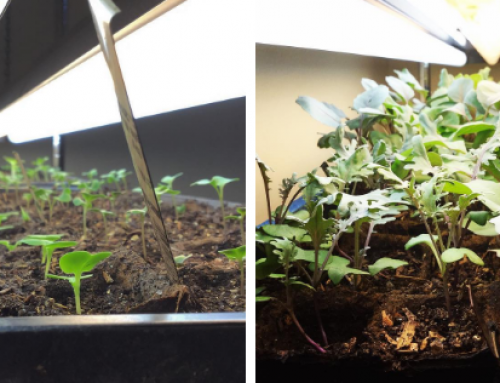 Let me repeat that: in growing food, our goal is not to be self-sufficient. That’s an impossible, unnecessary and probably even destructive aim. Like plants, humans are not solitary organisms. We work better in diverse teams; we live better in diverse communities. We each bring unique skills, resources and knowledge “packages” to the table that make the output from our collective performance/activities far better than if we try to be a one-man or one-woman show. I don’t want to mine my own metal and mold my own plastic to make my own car. 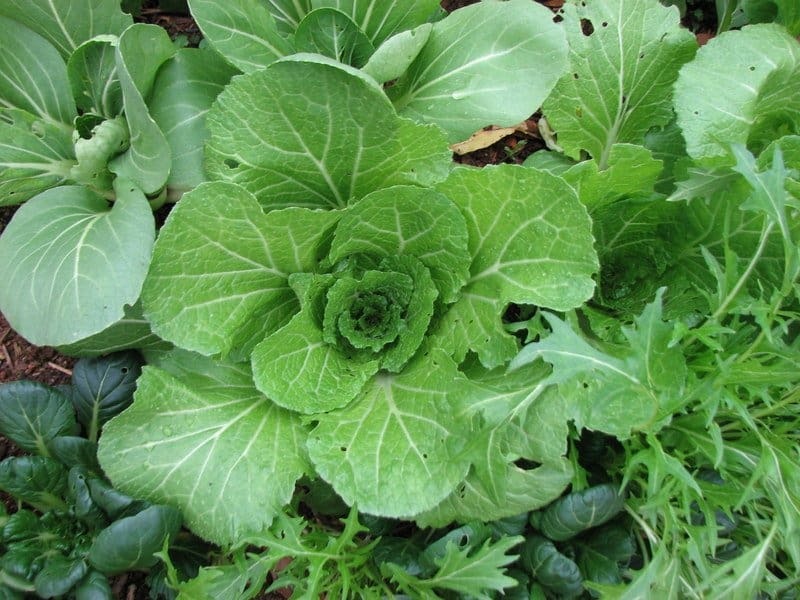 I do, however, want to grow a lot of my own food because I need to: psychologically, physically and intellectually. If I’m not deeply interacting with and gaining a better understanding of nature/ecology on a weekly basis through my garden and reading, it throws me off—I’m no longer me. It might be difficult for people who don’t practice permaculture or organic gardening to understand this. Whether we’re willing to acknowledge it or not, we’re all walking talking gardens of microbial life, and the human superorganism needs to interact and connect with the gardens of life around it in order to work optimally, just as a fish needs to swim through water. We are not separate from nature; we are nature. I don’t want to hide from my biological reality in a sterile, sanitized space where I can gaze at nature through a separating window, I want to embrace and nurture it. Thus for me, organic gardening is a need, not a want. 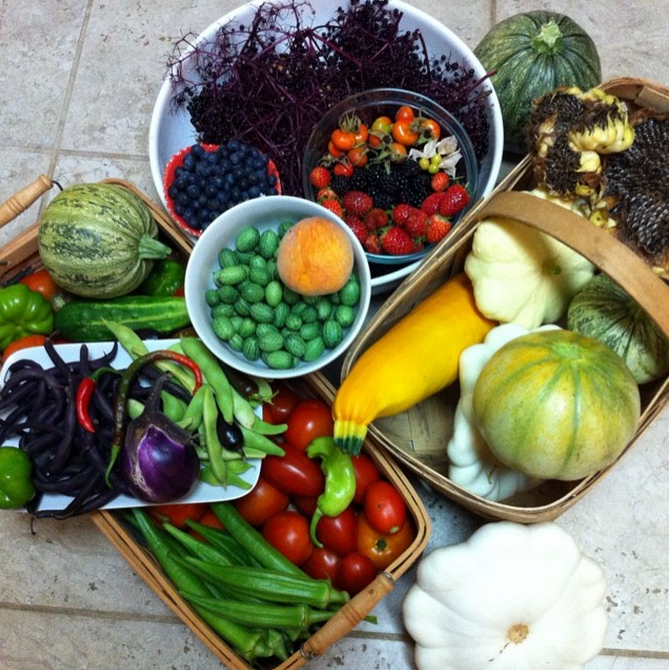 Want some real examples of food we regularly harvest from our garden and walks in the forest? Some of our best performing crops are our white oak acorn trees, that produce hundreds of pounds of acorns each year. 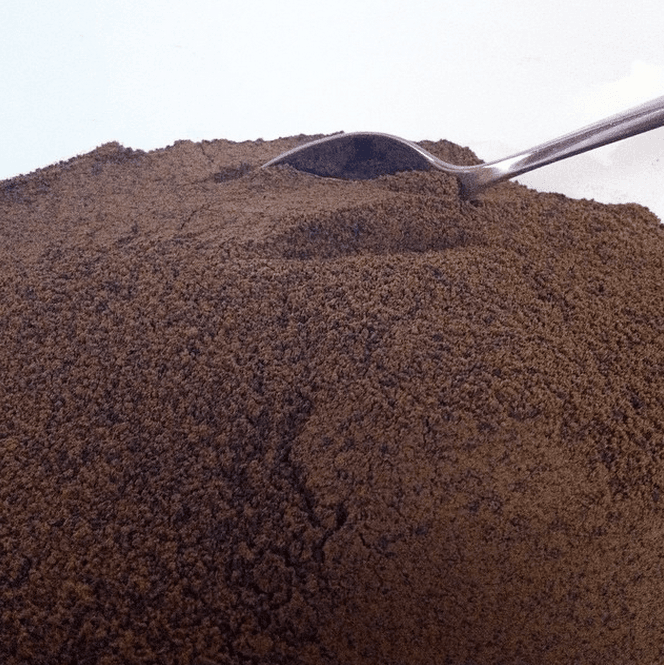 We use it to make hot and cold-leached acorn flour, acorn grits and as a healthy, nutrient-rich addition to our ducks’ food. 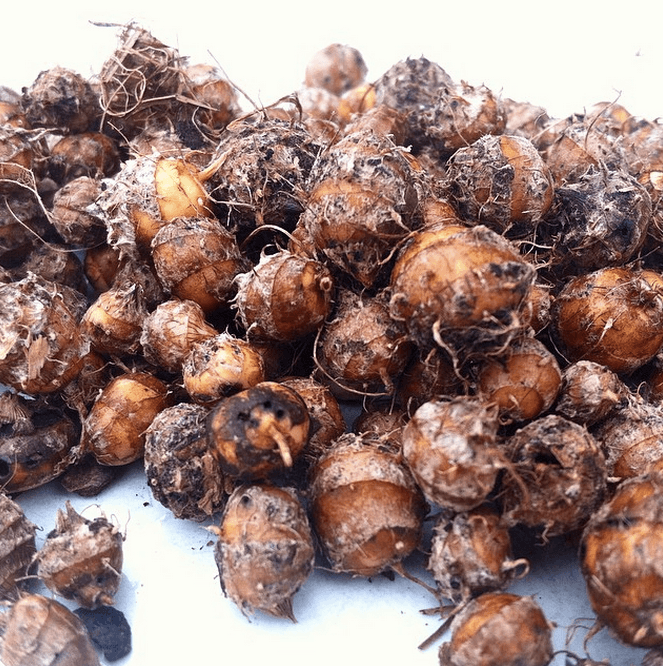 Chufa (Cyperus esculentus) aka “earth almonds.” Its delicious underground tubers taste like raw coconut. A favorite summer dessert: fresh toadskin melon, juiced lemongrass, muddled ginger and black locust flower sorbet (all ingredients harvested from our garden, except for the locust flowers which were foraged from a nearby forest and made into a liqueur). 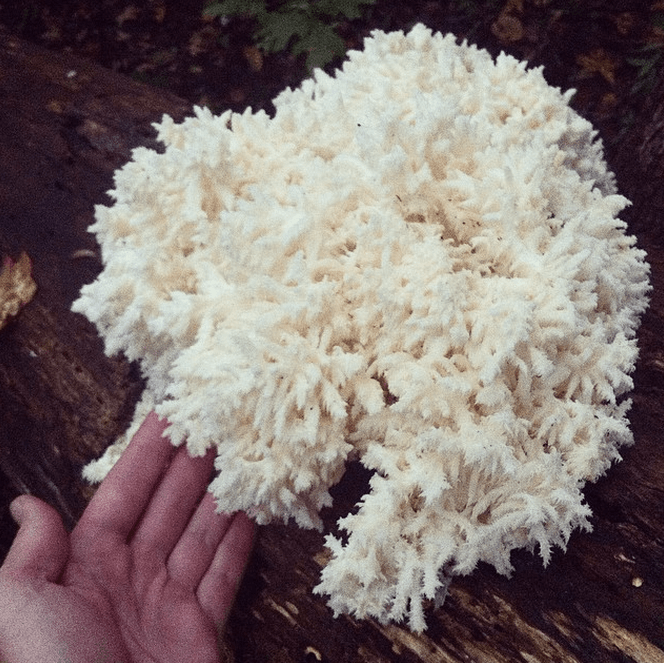 We inoculated a fallen poplar tree in our forest with a Coral Tooth Fungus we found on another foraging adventure. Coral Tooth Fungus is a potent medicinal mushroom that scientists think may hold the cure for alzheimer’s disease and a number of other mental illnesses. It also happens to taste like lobster. 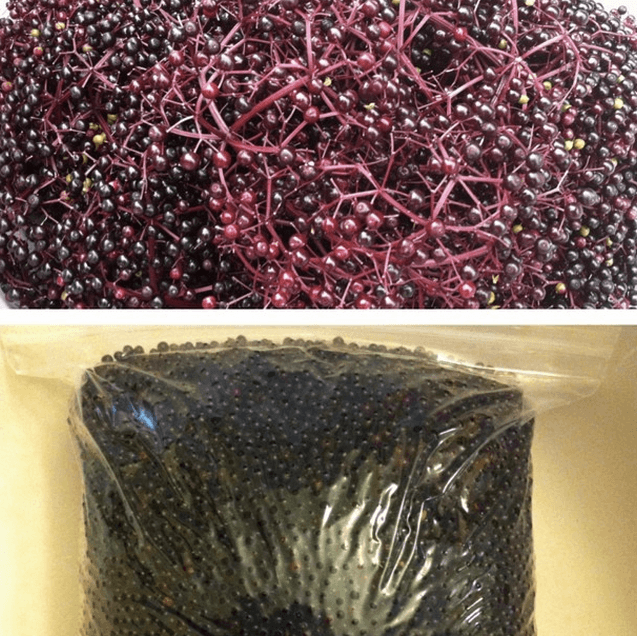 We grow three different varieties of elderberries that produce more fruit each year. This was one night’s harvest in summer 2014 (6 pounds). A few ounces of processed organic elderberry juice will cost you about $20 at a health food store. Why? 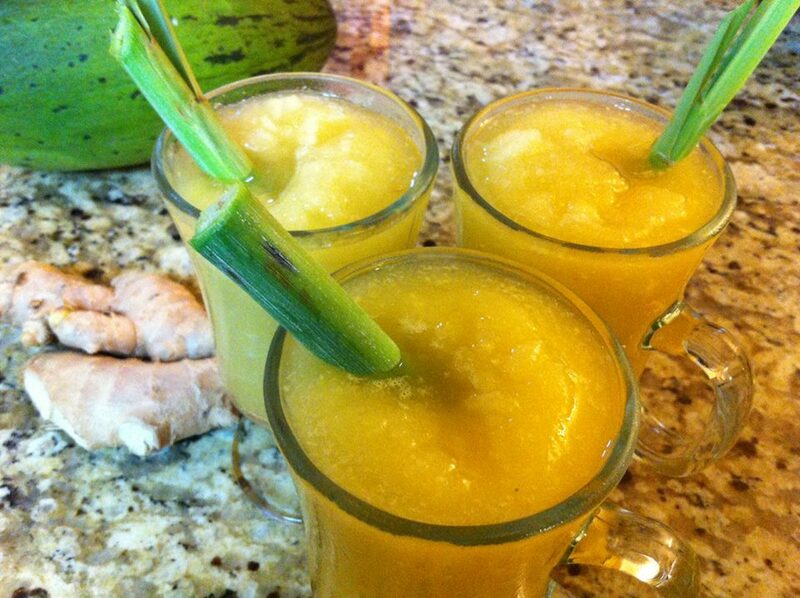 Three peer-reviewed studies have shown that it can prevent or treat the flu. 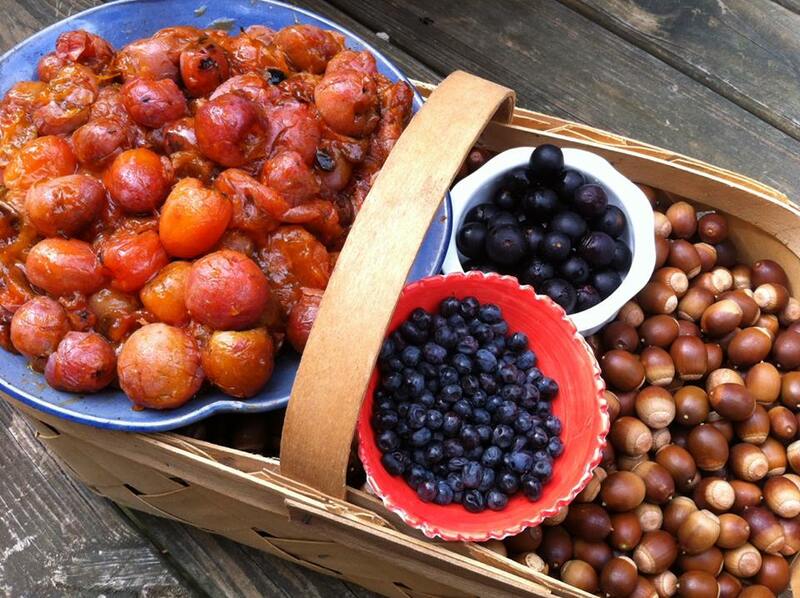 Wild-foraged persimmons, muscadine grapes, tupelo fruit and acorns from a fall walk in the woods. Our native persimmons are one of the most delicious fruits we’ve ever eaten. They can’t be stored or transported to a grocery store since they virtually turn to mush when they’re perfectly ripe. 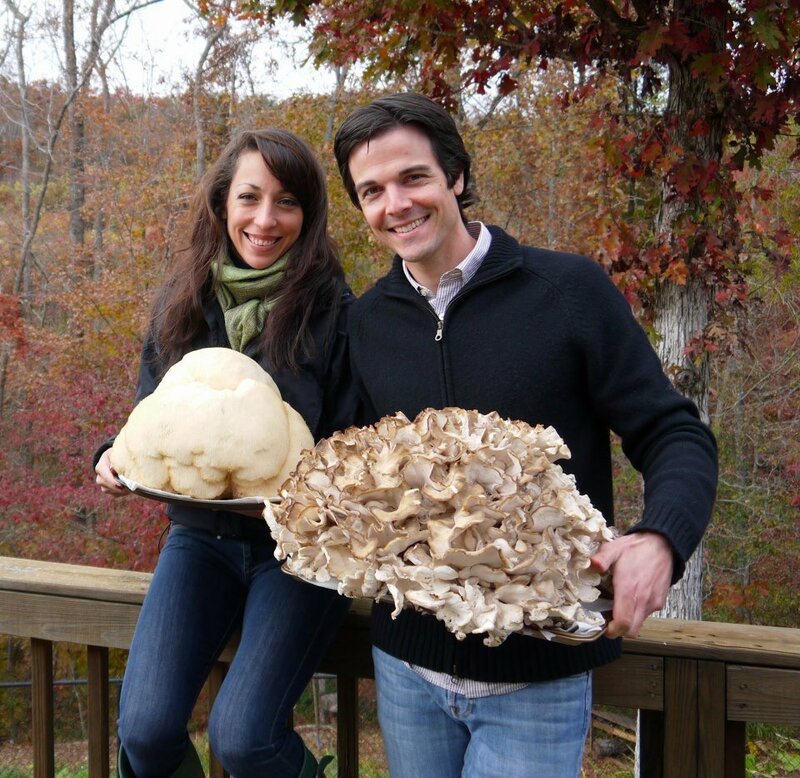 Two prized edible and medicinal mushrooms, both weighing over 20 pounds: lion’s mane (left) and maitake (right). Both found on a fall foraging excursion. A homegrown black futsu pumpkin, a Japanese heirloom so sweet and nutty by itself, that it requires no sugar or spice when eaten. 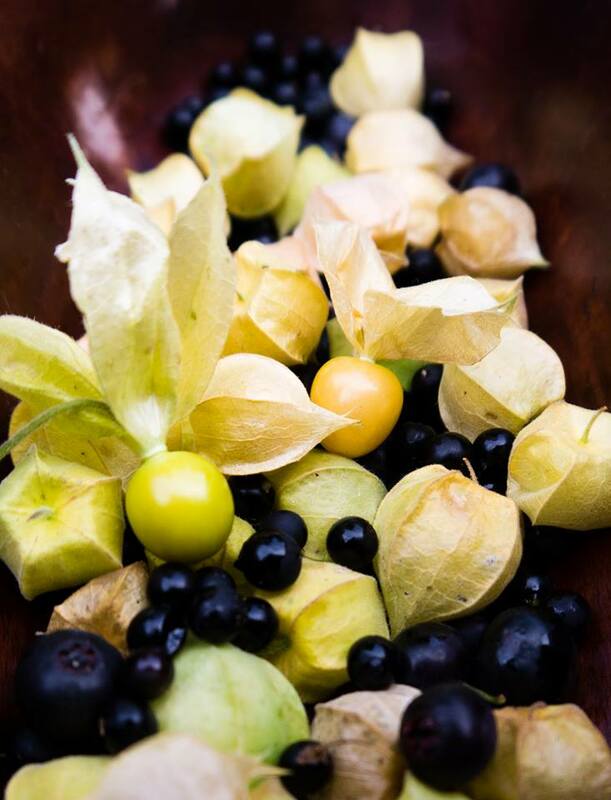 Garden huckleberries, cape gooseberries aka Incan golden berries, ground cherries, and wonderberries. Delicious heirloom fruits in the Physalis family that we grow each summer in our yard. Susan holding Tromboncino squash growing over top of our duck houses. 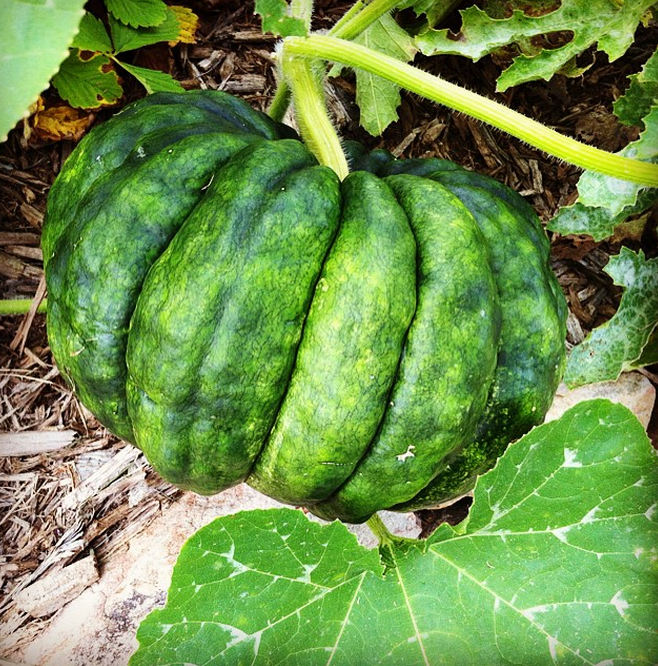 Tromboncinos are an Italian heirloom that are excellent eaten as a summer squash or allowed to grow larger, are better suited as a storing winter squash. This is a fairly typical summer night’s harvest from our yard. 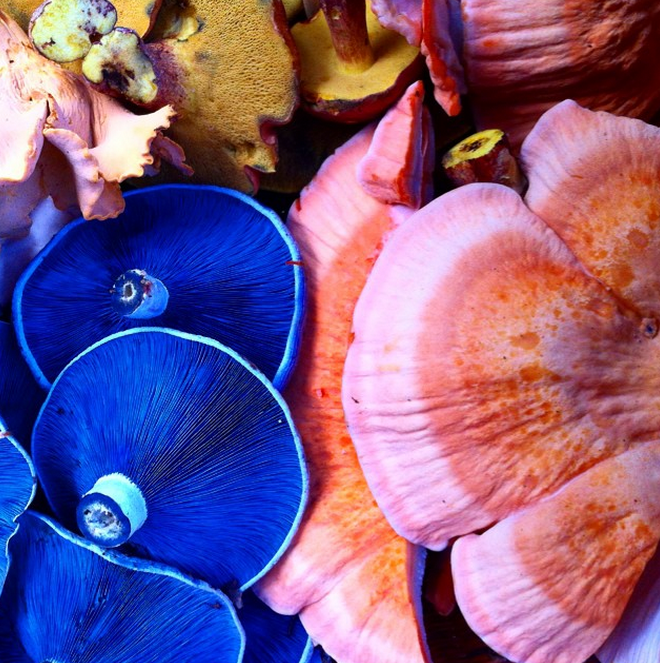 A mix of gourmet summer mushrooms: chicken of the woods, lactarius indigo, bicolor boletes and chanterelles. 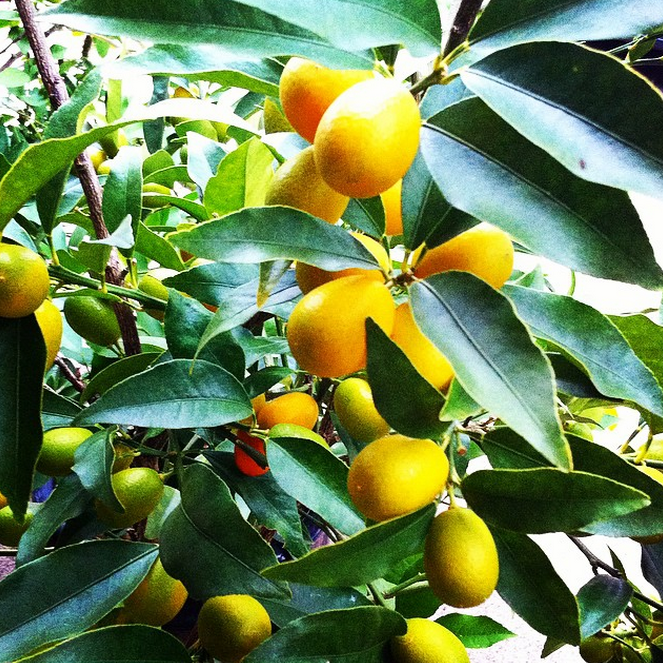 We love citrus and grow many varieties in pots that we bring indoors in the winter months, including kumquats (pictured), blood oranges, multiple varieties of meyer lemons, tangerines, calamondin orange and makrut lime. We also raise Welsh Harlequins, a heritage breed duck, that can outperform chickens on egg production. 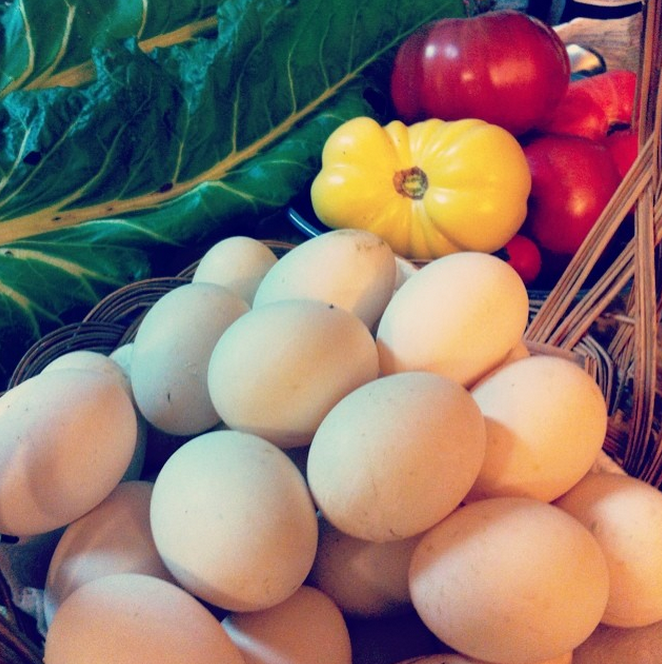 Eggs are our staple protein. 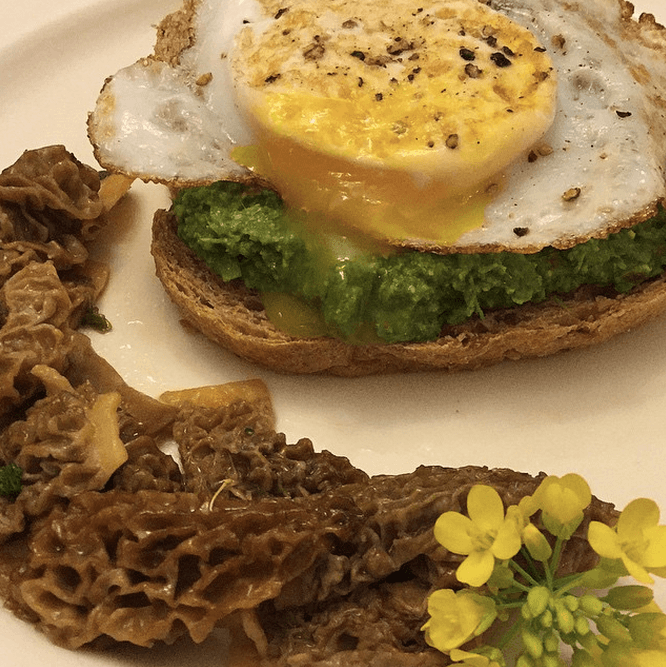 Duck egg served over stinging nettle pesto and organic whole wheat bread served with foraged morel mushrooms in sage sauce garnished with radish flowers. We didn’t grow the wheat, although we are growing red winter wheat this year. From June through October we pick piles of fresh fruit and berries every day. 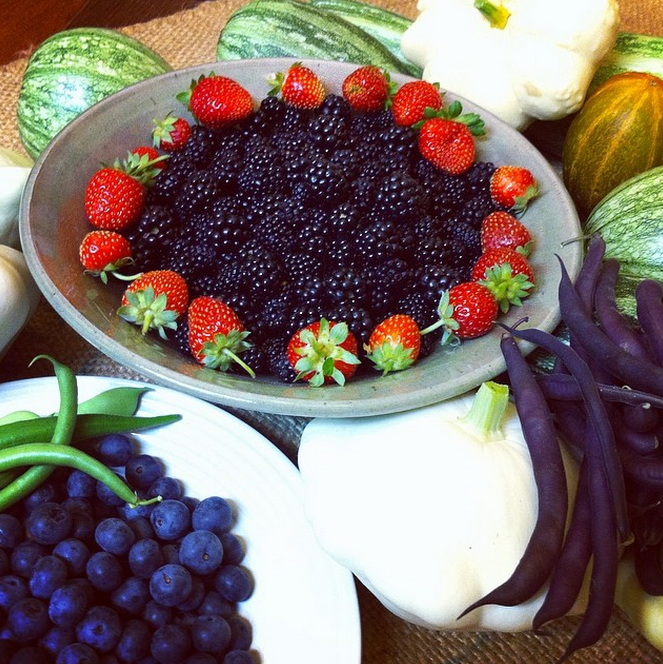 Pictured are blackberries, strawberries and blueberries with an assortment of other homegrown veggies and melons. We make a lot of food (especially pizzas and bread) in our wood-fired cob oven. The coals are removed as soon as the oven is hot enough for cooking (it can heat to 800 degrees) and put into our duck pond, where they are “charged” and turned into biochar before being used as a soil amendment in our garden. Like a knife, money is a tool that can be used for good or for ill. It can be used to chop veggies to feed a family or to commit a crime. As mentioned above, money is often a very clumsy, one-dimensional instrument of measurement when it comes to many of the transactions we make on a daily basis. With these qualifications in mind, if we were to add up all the food we grow and forage throughout the year (or get a boutique, organic grocer to put a valuation on it), would the fair market value (our “savings”) be $24,000? Yes, we think so. Or possibly higher. But the question is irrelevant because we can’t buy many/most of these foods at all or at the quality/freshness that we enjoy… which is one of the primary reasons we grow and forage them. All too often, we’re tricked into making terrible, costly decisions by the allure of “cheap.” Nowhere is this more true or more destructive than when we buy food. Cheap food destroys the environment; it destroys our communities and local economies; it creates human slaves; it destroys our physical health; it destroys our wealth. It’s only good for whoever happens to be sitting at the tip of that pyramid of destruction—those who privatize the gains of that model, while socializing the losses (e.g. everyone else pays for the mess created for the financial benefit of a few). These are the types of rapacious, extractive business models that were originally brought into being by the Dutch East India Company in the 1600s; as a civilization, we need to hasten our transition to models/paradigms that conscientiously internalize externalities while providing a level of transparency that truly allows informed, ecologically literate citizens to make decisions that are in their enlightened self-interest. Until we do, we’ll remain blindfolded and handcuffed passengers on a ship drifting towards storms of our own making. And to those folks that benefit from “cheap” food, please note that true wealth is not created by writing checks against our collective future or extracting it from previously functional ecosystems. That’s called theft, and you’ve created a debt that others are currently paying or will have to pay, assuming we/they have the resources and ability to do so. This is not an assault on capitalism; we believe socially responsible capitalism has a huge role to play in creating a better future. This is an attack on a way certain people and organizations are currently playing (or scamming) the system. So why do we choose to grow organic, heirloom foods and want other people to as well? To us, food is not a commodity, but it is an investment. It’s an investment in our personal health. It’s an investment into the type of world we want to help create—one with clean air and water, living soil that fosters and sustains the massive array of beneficial microbial life that makes us and our food healthy while sequestering atmospheric carbon. It’s an investment into our community and our local economies. It’s an investment into the local farmers and their families (our friends) who we personally know and help support. They get up every morning and do things right even if it’s not the “cheapest” way to do it, because they know the high costs that everyone else will have to pay tomorrow if they choose the cheap path. They just hope that there are enough people in our community who value what they do and have enough pennies in their pocket to make the right “vote” when they go out to buy groceries. By growing a lot of our own food (instead of turf grass) it becomes much easier for us to make the right decisions for the groceries we do have to buy. We’re thankful we can make that choice. And we don’t know how to put a price tag on it. Frankly, doing so cheapens the true value it adds to our lives. 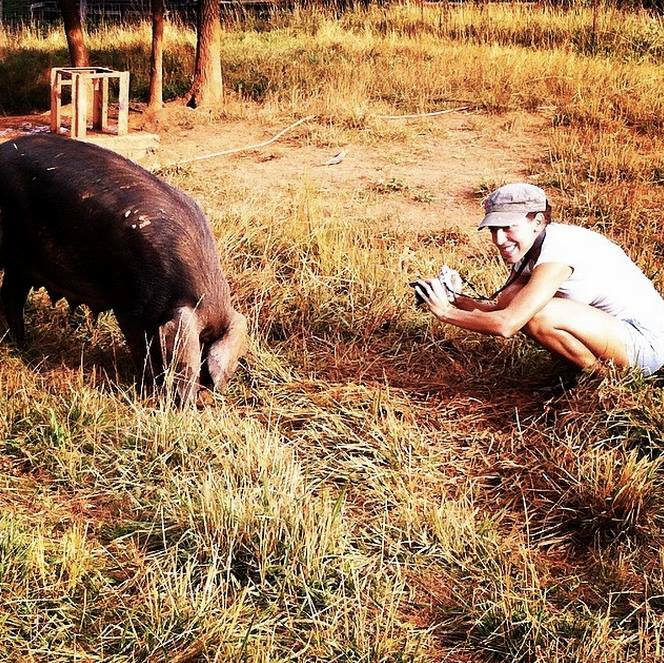 Susan meeting her bacon at Walker Century Farms, our friends down the road in Anderson, SC. Among other produce and livestock, the Walkers raise grass-fed, grass-finished Red Devon Cattle (the oldest breed on earth) on their farm that has been in their family for over 100 years. Everything you say is 100% correct. You guys are awesome. I do as much as I can on a rental property, but when I do have a house I hope my yard to be much like yours! I am trying out hibiscus for tea this year thanks to an article I found on your site. I also feel the same way about promoting native plants in the landscape that benefit wildlife and/or are edible. Finances are important but we should also be looking at what good we can do for ourselves and the environment and community around us that is within our means. If it was only about money you’d probably just be buying the cheapest stuff you can find at Walmart. Would like to know of your sources for heirloom seeds and plants, please. Kathryn: It varies. For our personal seeds that we grow in our own garden, we don’t have to be very picky – we can get them from gardening friends, family, etc. 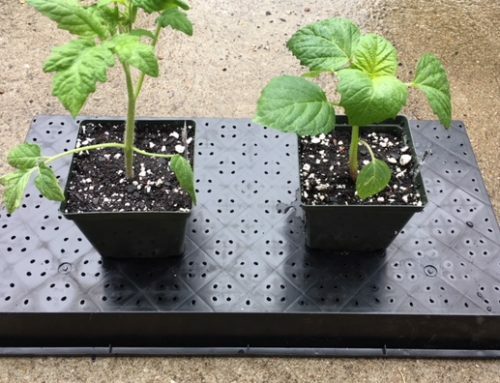 However, our company (GrowJourney Seeds of the Month Club) is USDA certified organic, so we have to be very careful about where we get our seeds: everyone up and down the chain has to also be USDA certified organic. This makes things more difficult, but we’re thankful for that because it ensures quality and that everyone is doing what they say they’re doing, as certified by an independent third party. At GrowJourney, we sources our seeds from a range of sources, from small family farms to larger seed companies. It really just depends on the season and the variety.